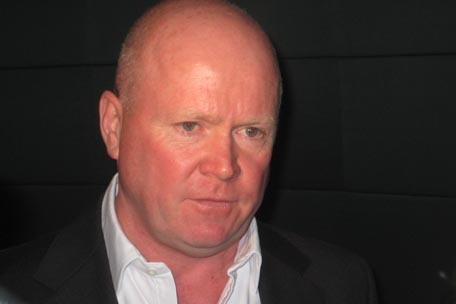 EastEnders' Phil Mitchell's mystery stalker will be revealed on Christmas Day (25.12.11). The Walford hardman - played by Steve McFadden - has been receiving cryptic messages in the post from someone who knows all about his past, and is seemingly set on revenge and although he may not find out his enemy's identity, viewers will. A source told Inside Soap magazine: "Fans will finally discover who's been harassing Phil for all this time. That's not to say that Phil himself learns the terrible truth though. The situation may well rumble on into the new year." Phil is also in for a Christmas Day shock when the mystery figure sends Denise Fox (Diane Parish) a USB stick with a recording of Phil claiming responsibility for the death of her husband Kevin Wicks. The source added: "Obviously poor Denise is in complete shock. So she goes out into the square and smashes up Phil's motor. He's livid when he sees the damage and demands to know who put her up to it." When Phil accuses Jack Branning (Scott Maslen) of giving Denise the incriminating file, Jack's hardman brother Derek Branning sends him packing.